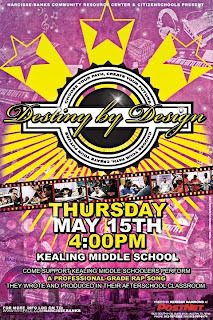 From the Happy Mother's Day department... the students @ Kealing Middle School will be performing on May 15th a rap song they wrote and produced. This is all part of an afterschool program called Destiny by Design sponsored by the Narcisse-Banks Community Resource Center. With the assistance of local artists including DJ Baby G, Tee Double, Lady Legacy, Gerald G, DaBosnian, AC, Wes Sanders, Recon, Capoeira da Rua, Guerilla Productions ATX, LuxuryMindz, Tosin, and Dat Boi Drew, a class of 7th and 8th graders studied the history and techniques of hip-hop culture. Weekly meetings over the course of the Spring semester will culminate with a performance by the kids on the Kealing Cafeteria stage at 4:00 the afternoon of Thursday May 15th.